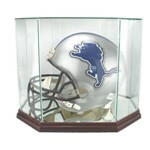 Our tabletop football helmet acrylic display case is beautifully designed and constructed. 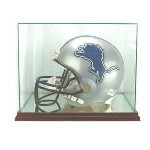 Full size football helmet acrylic case with all clear construction so you can see the helmet from all angles. investment in the protection of your memorabilia collection. Includes 1 free nameplate. 16 x 12 x 12. Full size football helmet acrylic display stand - holder featuring a custom shape helmet holder. 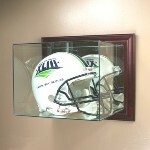 if you want to display your football helmet, but dont want-need a complete display case. Wall mountable full size football helmet acrylic case with black base and gold risers. This is similar to our desktop case, but with a wall mound bracket on the back. Features a full mirrored back. Also features optically clear, richly beveled UV protected acrylic, all handcrafted and polished to a high luster This is not one of those cheap, mass produced display cases. This is a high quality investment in the protection of your memorabilia collection. Price includes 1 free nameplate. THIS CASE PROTECTS FROM 98% OF HARMFULL UV RAYS. construction is the best protection for your collection. 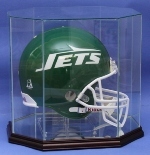 Interior dimensions are 15.5" x 11.5" x 11.5"
Ball Qube single full size football helmet acrylic case. Features optically clear acrylic. This is a high quality investment in the protection of your memorabilia collection. Price includes 1 free nameplate. Additional nameplates are available. 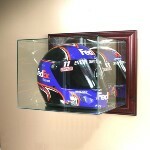 Desktop full size race car driver's helmet acrylic case with black base. for a larger helmet like a motorcross helmet or helmet with respirator. Wall mount larger size drivers helmet glass display case featuring a furniture grade wood frame, mirrored back and real UV protected glass. Includes 1 free nameplate. Interior dimensions are 14 x 12 x 11. Our unique hinged design allows for easy access. Mounting hardware is included.